Chicken breasts, butterflied, then rolled with garlic butter and herbs. Oven ready, pre-heat and bake! Served with a side of baked mashed potatoes. Preheat oven to 400°F. Place the pan of chicken in the oven and bake for 25 to 30 minutes. 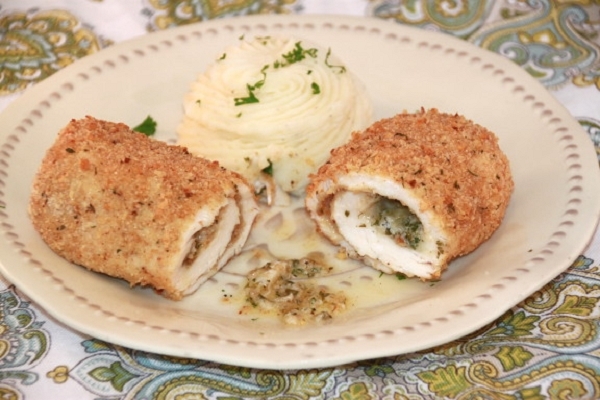 Serve with baked mashed potatoes. I had to order this meal early, as it sells out ahead of time. The chicken is delicious and well seasoned. The potatoes side are creamy. Just pop in the oven and cook. So easy after a hard day at work! I was finally in Houston to partake of one of these delicious meal! Great taste and easy! This was simple to cook and very, very tasty! 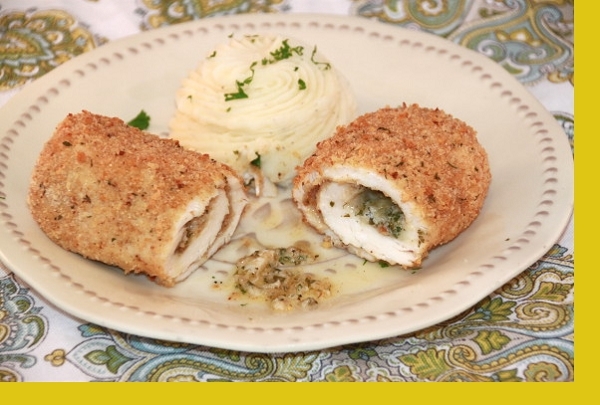 One of our favorite special meals, we love how easy it is to prepare and how moist and tender it is. We have had this several times and it always is a perfect score! This was the perfect weeknight meal for a busy family. Everyone loved it, and best of all, the only work required was putting it in the oven. The baked mashed potatoes were delicious too!